Give your Toshiba Satellite L505D series notebook a new lease on life with the Toshiba V000185580 AMD Intel replacement motherboard for Toshiba Satellite laptops. These motherboards from manufacturer Toshiba are ideal not only for simple replacement of a faulty motherboard in Toshiba Satellite L505 laptops, but also for complete laptop rebuilds or even constructing an entirely new computer completely from scratch. This S1 socket Toshiba satellite motherboard includes the processor and heatsink, and also features two USB ports for the input and output of data and information, so you can connect multiple devices. Connect your camera and transfer photos, or your music player and transfer music files back and forth between the two devices. You can also use the USB ports to connect your Toshiba laptop to another computer. 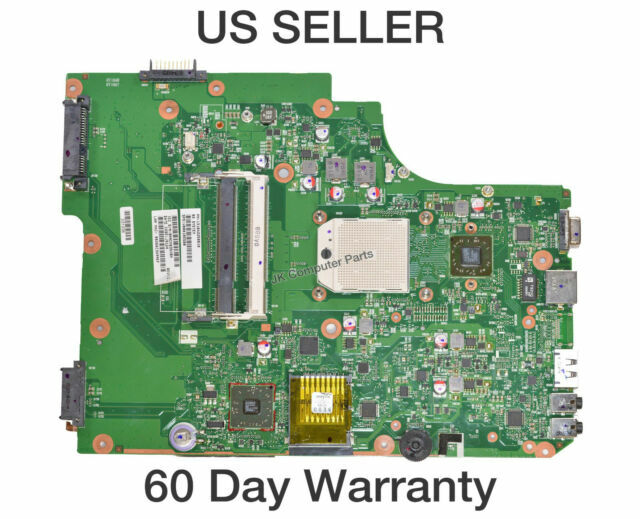 The Toshiba V000185580 AMD Intel replacement Satellite motherboard is easy to install in your Toshiba Satellite L505 laptop. This is because it uses a single socket design that makes it quick and simple to transfer into another Toshiba Satellite L505 series laptop, without the need for the availability of a lot of tools. A computer’s motherboard is essentially what drives it. If the motherboard malfunctions, nothing about your computer will work and you’ll be forced to either buy a complete new laptop or install a replacement motherboard on your own. Installing a replacement motherboard has several advantages, including being more budget-friendly than buying a whole new computer. It also eliminates the need to search for a new laptop that you like as much as your current Toshiba Satellite or compare an endless list of prices before finding one in your budget. If your computer is in good working order otherwise, for example if your LCD screen is still in mint condition, you might want to make your investment last longer by replacing the faulty motherboard. The Toshiba V000185580 motherboard is a circuit board that houses all of the principal components of a computer, and also has connectors for attaching additional circuit boards. This is why the motherboard is such a crucial component of any electronic device. The Toshiba V000185580 AMD motherboard CPU is ideal for boosting your laptop’s RAM, so you have plenty of computing power, memory and storage space, for both your business and recreational computing needs. The Toshiba V000185580 AMD motherboard replacement part is compatible with the Toshiba Satellite L505D series notebook. With this motherboard, you’ll have your Toshiba Satellite laptop up and running in no time, so you can get back to work, or to simply using your laptop for online shopping or to type a quick email to a colleague. Founded in 1965, Toshiba quickly became a world leader in the electronics industry, developing and manufacturing devices for personal, commercial and industrial use. It’s known for its durable, high-quality and high-performing devices that are powerful and sturdy enough to stand up to intensive business use, but user-friendly enough for personal and recreational use as well. The motherboard look phisically well and run fine at first time, no installation or bios issues, all the pheriperials work well, nice product!